1. How long have you been singing harmony? What prompted you? Maggie: I had started my first semester at university (Fall 2011) and felt very far from home. I was cruising Youtube and happened upon some sad songs. One of them caught such a strong hold of me. Every word was so precise, so perfect, and the melody was so melancholy and reminiscent. It was a song about missing and longing for a home that you could never return to. For a girl who was and continues to be in love with the peace and simplicity and heartbreak of home, the song became an anthem. The song was “Down Along the Dixie Line,” written and performed by Gillian Welch and Dave Rawlings. I’d never listened to them before, but I’ve been tuning in quite intensely ever since. I carried that song home with me, and sang it by myself in my room until I got brave enough to sing it for company. My sister and I tried harmonizing with it somewhere in there, just to see if we could make something pretty on our own - and so the idea of sister harmony just kind of sneaked in. We had no aspirations, really. We just liked the way it sounded when we mixed. We sang together in Abbey’s room, just for fun. 2. Do you come from a musical family? Tell us about them and if you have a favorite music memory of them. Abigail: On my Dad's side of the family there is a genuine interest in music and singing, especially harmony. Maggie: We have a great uncle who would play songs on his guitar at family gatherings. I remember his songs from when I was just a tot. He played “There Was an Old Lady Who Swallowed a Spider.” I laughed and laughed at that song, and at Uncle Bob, too. He put character into an already-great song. I think my favorite memory is of him playing “When You and I Were Young, Maggie.” Such a sad, sweet song. He still plays it when we have gatherings – he knows I love it. 3. You both belonged to a community singing group called Saving Grace when you were young. 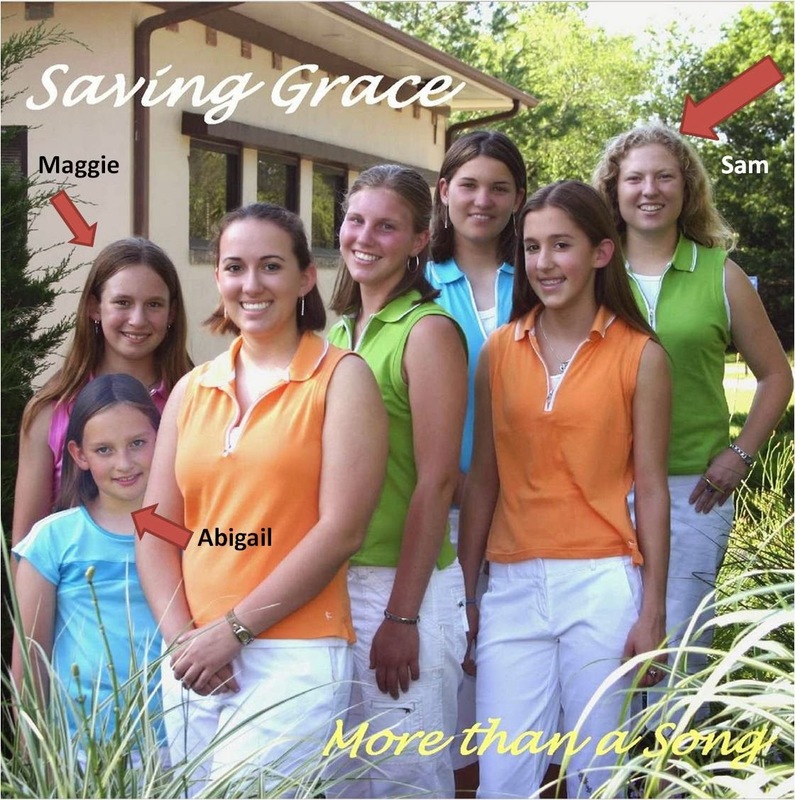 How long were you involved in Saving Grace? What was your part in the group? Maggie: We performed with Saving Grace from 2000-2005 and recorded a collection of songs our last year. When we were in Saving Grace, I was terrified of performing for people. I stammered and gulped. It was awful. But the other girls made it fun. Our oldest sister, Sam, was the brave one. She’d sing anything, loudly and with clarity. I never could do that for an audience. Abbey was the youngest in the group, and the hammiest. Abigail: I always felt like the small and annoying cheerleader who knew every song BY HEART. 4. What instruments do you play? Abigail: I play a Collings CJ35 guitar and Collings MT mandolin. Maggie: I’m working with guitar, fiddle, and harmonica. 5. How long have you been playing? Taking lessons? Maggie: I started playing the guitar after I graduated from high school – back in 2009. I only took a few lessons, and I’m afraid I wasn’t as attentive as I should have been. That’s why I only play the simplest chords. I began picking at the fiddle in 2012. Didn’t touch it much. I began taking lessons in earnest in January of 2014. Me on a harmonica can be comical. But it has such a cool sound – kind of a wail. Quite underrated as an instrument. I have trouble getting my breathing down with it. 6. Does anyone in your family play an instrument? 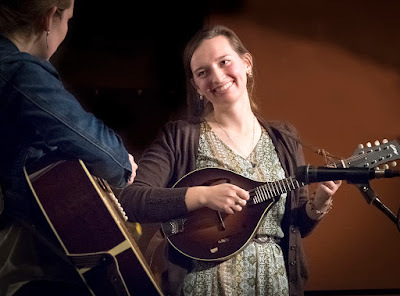 Abigail: Our Great Uncle Bob plays guitar and mandolin, even a little fiddle. A great grandma on my Mom's side played the fiddle, though I didn't know about it until this year! Mom plays the piano, and taught my sisters and I how to play. Maggie: Mom gave me piano lessons when I was a kid. I was a terrible student. Wouldn’t listen, wouldn’t practice. (See, people think we’re so nice. But really, we’re just disobedient little sinners.) She played lots of music when I was little. Not so much anymore. Sometimes she’ll sit down and play hymns. I like it when she does. 7. When did you start performing? Maggie: We started working on our harmony in 2011. We started performing the following year – it was late May at Katy Days in Parsons. We entered a singing competition. We sang “Down Along the Dixie Line.” I think maybe we surprised some people. 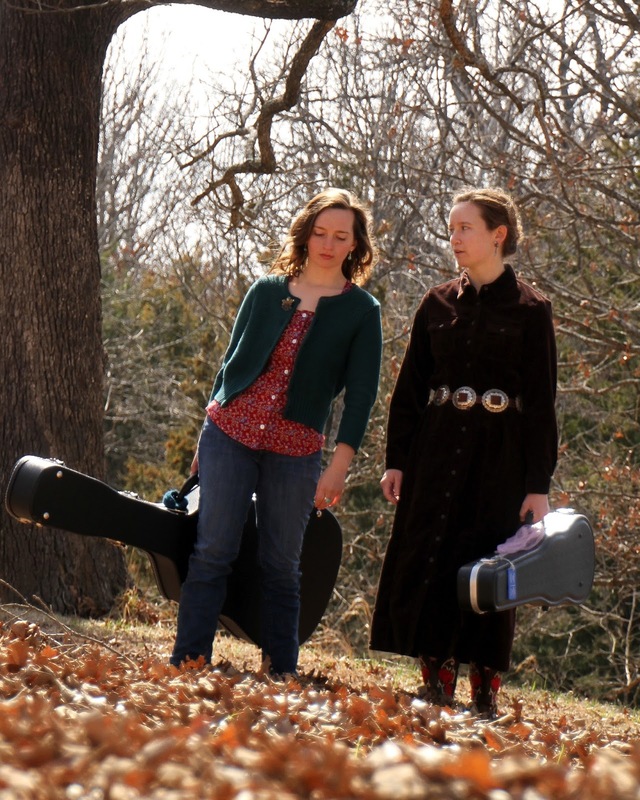 Lots of folks in our area are unaware of (or indifferent to) folk music. Anyway, we made it to the second round. We sang “Traveling Soldier,” even though we knew it would be too long based on the competition specifications and would probably get disqualified. We figured we wouldn’t win, anyway, so we decided to sing a good, long song – just because we wanted to. We didn’t place in the competition, but something even better happened afterward. Russell Head, then department head of the Labette Community College Recording Arts program, approached us about recording a CD. Though hesitant about walking into such an undertaking (and, I’m now ashamed to say, such dependence on a stranger), we did it. And guess what? I discovered that not only is Russ Head brilliant and incredibly knowledgeable about composition and instrumentation and harmony and recording; he’s also kind, honest, and humble. 8. How many concerts do you schedule in a year? Where do you perform? Abigail: We schedule between 3-6 performances a month--except December, which we take off. We perform all over Kansas and the Midwest. It's fun driving to so many different places to sing, meeting people of various backgrounds and character. In the summer, we try to travel further distances and have been to Colorado twice and are currently planning a Great Lakes Tour in the Upper Peninsula of Michigan (2018). There are plenty of coffee shop gigs, but we also go to festivals and do an occasional auditorium-style event. Festivals are always a highlight for us, even though they cause nervous anxiety that's really....well, awful, but other than that they're great! We've started booking house concerts this year and are looking forward to those. 9. Will you perform at churches, weddings, or funerals? Both: As of now, our typical answer is no. We are of a very conservative Lutheran faith, and we prefer not to perform at church services or functions. As for weddings or funerals, this again, plays into our first answer, as we believe that our music is not suited for such events, and we will not schedule this type of event onto our calendar. 10. What has been your favorite performance/venue to date? What did you like about it? Abigail: I really liked playing on Stage 5 at the Walnut Valley Festival because the atmosphere was incredible! Everyone was so kind to us - a wild yet interesting environment. However, there are many special-moment performances. Our grandma made us awesome 50's style dresses for our first auditorium concert (which was basically our first real, hired gig) and our grandparents sent us flowers. 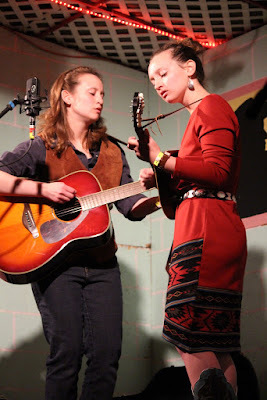 Maggie: We opened for Jimmy Fortune in December 2012. Holy smokes, that man was unforgettable. Quiet and polite and gentle, then BAM! He slams you with that voice. Golden pipes. Wow wow wow. I’ll never forget it. We were terrified during the opener, so we were quite shaky and a bit off. 11. How long have you been writing your own music and lyrics? How many original songs do you have? Do you have a favorite? Maggie: We’ve been writing our own songs for a couple of years now. We have a system going. I write the lyrics and come up with the melody. I sing it for Abbey, and she changes it and makes me mad. Ha – only half-kidding. Abbey is definitely an editor. She has an ear for those little note/chord changes that make a song better. Or a word change – to make a phrase easier to articulate. She’s been writing some songs recently, too. We have different styles. She’s more complicated melodically. I tend to focus more on the lyrics. Right now we have over 30 originals. 12. What prompts you to write a song? What is your process? Abigail: I feel in the mood to write a song, so I write a song. And then I go through it thinking of the beat and what words sound the best and unique. Maggie: I have no process. Usually I write sad stuff – missing home, unrequited love, hurt. Sometimes, though, I pump out a happy, slightly up-beat song. I really enjoy putting story to song. Stories enchant me. 13. You’ve been known to sing sad songs. Why do you like sad songs? Abigail: I suppose it's because there's so much emotion that's related to for every person. Everyone can place themselves in a situation by pulling emotions they've experienced from their own lives. Maggie: People ask us why we sing so many sad songs. A lot of people dig the feel-good tunes – and that’s fine. But joy and grief go hand-in-hand, just as life and death do. I guess grief and despair resonate more readily in us. Because life is sad. Happy endings are endearing and heart-warming, but unrealistic. Only one ending is happy – heaven. Other than that, life is a struggle. It’s a war between evil and good, natural and spiritual, man’s will and God’s will. I struggle within myself between what I want and what is right. I know what is good and right, because I read it in the Bible. I know what evil lurks within me, because I feel it every day. Life is no sunshiny thing. Life’s a beast. I suppose that’s why we like simple, sad songs about struggle. They’re real. 14. What do you like to do with your free time when you’re not making music? Abigail: Homework, reading, exercise if I can, practicing, and taking pictures. Maggie: I read and watch documentaries and films. And try to make my horse behave. 15. What about school? Family? Church? Work? Abigail: I graduated high school in 2015 and currently attend Pittsburg State University. Maggie: I graduated from Pittsburg State University with a Communication degree in December 2013. Broadcasting student. We’re Lutherans. Missouri Synod. Hoorah! I work as a bank teller. So that I can afford resin and fiddle bows. 16. What’s your favorite food/restaurant when you’re on the road? Abigail: Spangles was cool. Donuts are nice and health-hazardous. Coffee is great, when it's made well--with lots of sugar and cream. Maggie: I like chicken and biscuits and fries. And lemonade, if I’m feeling wild. Oh, and I'm a real fan of Kettle Corn! 17. What’s your favorite movie/musical? Maggie: I’m a fan of westerns. The Coen brothers’ “True Grit” was beautiful. I just wish it would have been longer. “The Assassination of Jesse James by the Coward Robert Ford” was also lovely in its grisly way. “Ain’t Them Bodies Saints” was almost lyrical. Then you go to the other end of the spectrum with “That Thing You Do!” and "The Hunger Games" films, “Some Like it Hot” and “The Sound of Music.” Movies are marvelous. 18. What is your dream musical venue(s)? Abigail: I don't have a dream venue...it's kinda just wherever singing takes me - meaning...wherever my manager (aka mother) books a gig at, and what happens, happens. Maggie: Austin City Limits would be cool. The Grand Ol’ Opry. How big can we get here? Carnegie Hall? The Ryman? 19. Do you have a particular artist with whom you’d like to meet and/or perform? Maggie: Gillian Welch and Dave Rawlings. Emmylou Harris. The Milk Carton Kids. I’d say Alison Krauss, but I’d probably just end up staring at her, and possibly weeping. Stuart Duncan! Sam Bush! 20. Describe your dream music tour. Abigail: Going to Europe would be an awesome thing to experience, but I try to be as practical as I can. Maggie: I don’t really care. Any place with a good sound system and even a handful of people who dig the music would be worth it. I would like to see some landscapes, though. I love the Rockies, and I’ve always wanted to see the Blue Ridge Mountains.